Friday April 7th 1899 I did baking. got the butter ready had early dinner and we went to town in the afternoon. Was over home a little while. Did the evening work and read in the evening. Saturday April 8th 1899 It was a pleasant day. I hurried through with the work. about ten oclock, Mother and Rob with Dorothy and her Mother came. I enjoyed their visit so much. Did evening work after they were gone. Sunday April 9th 1899 I was busy most of the forenoon with the work. I read in the afternoon awhile and then Will and I rode down to see [Pink?] about coming to work for me. We went up to inquire about Mrs Bell. I did the evening work and read in the evening. Monday April 10th 1899 I did baking and churning in the forenoon and some mending and worked on my rug in the afternoon. The boys began to sow oats down on Eds land. 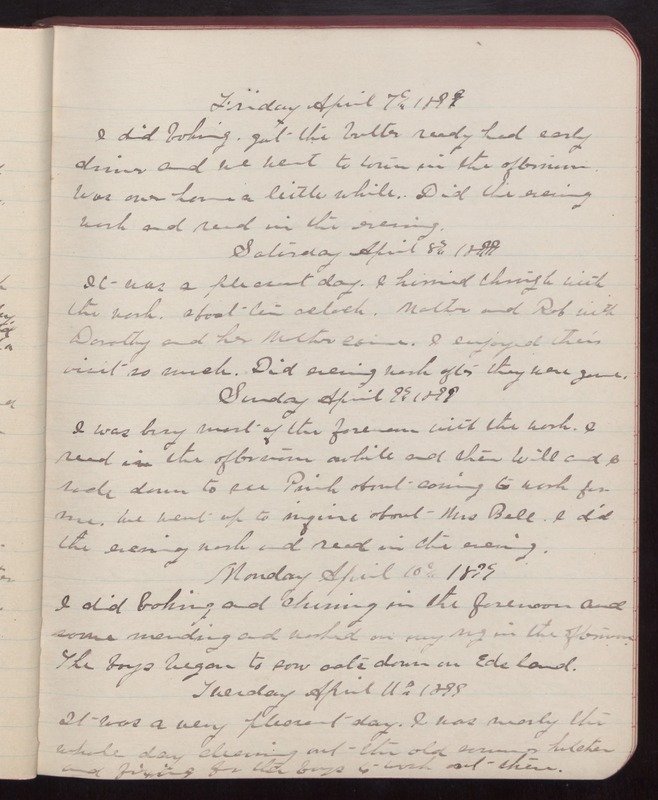 Tuesday April 11th 1899 It was a very pleasant day. I was nearly the whole day cleaning out the old [summer] kitchen and fixing for the boys to work out there.